We hope everyone is having a wonderful Christmas break! Merry Christmas and Happy New Year! We are all looking forward to the second half of our school year. We are excited to teach your children! In honor of the holidays, please know that our administration, faculty, and staff might not respond to e-mails from December 16, 2016, through January 2, 2017. Thank you for your understanding. Mark your calendars now for parent-teacher conferences and registration on Thursday, February 16, 2017, 4:00pm – 8:00pm and February 17, 2017, 8:00am – 12:00pm. Your Letter of Commitment for the following school year has been sent out soon via email and will be due by January 12th. This Letter of Commitment is what holds your spot for the upcoming school year. We wanted to let you know that it is important that you return the form in a timely matter as we have a waitlist for many grade levels and continue have growth on the list. National School Choice Week provides an unprecedented opportunity every January to shine a positive spotlight on the need for effective education options for all children. Independently planned by a diverse and growing coalition of individuals, schools, and organizations, National School Choice Week features thousands of unique events and activities across the country. The week allows participants to advance their own messages of educational opportunity while uniting with like-minded groups and individuals across the country. Participants in National School Choice believe that parents should be empowered to choose the best educational environments for their children. Supporters plan events that highlight a variety of school choice options — from traditional public schools to public charter schools, magnet schools, private schools, online learning, and homeschooling. National School Choice Week is a nonpartisan, nonpolitical public awareness effort. We welcome all Americans to get involved and have their voices heard! Middle School and fifth-grade students will soon be able to wear jeans every Friday as long as they wear a logo shirt from a Legacy Academy sponsored club, sports team or if they purchase a Legacy Academy polo with an embroidered Legacy Academy logo. These can be purchased through Educational Outfitters or your student may get an order form at the office. Jeans may be worn with one of these shirts every Friday throughout the school year, but the shirts MUST be acquired through the Legacy Academy office (from Educational Outfitters). December 16, 2016. Any lost and found items that have not been claimed before the end of the day on 12/16/16 will be donated to a charitable organization. Please mark your student’s name on their belongings! We are looking for help with a roofing project as well as a construction project. The modular classroom (music room & teacher library) needs a new roof, skirting, and wheelchair ramp repair. If you could assist on a team with this type of project, please call Ms. Anne (303)646-2636. Do you have a corner lot or a highly visible location where you would be willing to advertise our school with a yard sign? We are looking for people who will place a sign in their yard for a three-month period, you will receive three hours of volunteer time. Please e-mail information at legacyk8.org or call the office if you can help! Thank you. The character attribute for January is cooperation. All students return from break! Welcome back! Legacy Academy Informational Tour 6:00 pm. If you have a friend interested in knowing about our school, please tell them about our tour. Nerf Night 6:00 pm – 8:00 pm in Legacy Academy gymnasium! This is an excellent time for families to play together. Parents are encouraged to play! Ages 7 and up (6yr olds may play if a parent is in the gym with them at all times, but all parents should stay for the event). The cost is $10.00 per person. Students may not bring their blasters to school during school hours. Bring your own blaster to the event. Do not bring darts or discs. Protective eyewear is provided. Parents will be required to sign a waiver prior to this event, no exceptions will be made. The waiver will be available at the office during school hours or at the event. If any questions, please e-mail LABOD@legacyk8.org. Monday, January 23 ~ Friday 27 National School of Choice Week! Thank you for choosing Legacy Academy! The spring kick-off, Donuts for Dad, will be January 12th at 7AM. RSVP at www.SignUpGenius.com/go/4090B4AAEAF2DA3FA7-donuts. Interested in signing up to be a Watch D.O.G. now? Email watchdogs@legacyk8.org. We hope everyone is ready for a wonderful Christmas break! Merry Christmas and Happy New Year! We are all looking forward to the second half of our school year. We are excited to teach your children! Your Letter of Commitment for the following school year will be sent out soon via email and will be due by January 12th. This Letter of Commitment is what holds your spot for the upcoming school year. We wanted to let you know that it is important that you return the form in a timely matter as we have a waitlist for many grade levels and continue have growth on the list. Legacy Academy Informational Tour 6:00pm. If you have a friend interested in knowing about our school, please tell them about our tour. Nerf Night 6:00pm – 8:00pm in Legacy Academy gymnasium! This is an excellent time for families to play together. Parents are encouraged to play! Ages 7 and up (6yr olds may play if a parent is in the gym with them at all times, but all parents should stay for the event). The cost is $10.00 per person. Students may not bring their blasters to school during school hours. Bring your own blaster to the event. Do not bring darts or discs. Protective eyewear is provided. Parents will be required to sign a waiver prior to this event, no exceptions will be made. The waiver will be available at the office during school hours or at the event. If any questions, please e-mail LABOD@legacyk8.org. Christmas Dress/Ugly Sweater No Fee Christmas gift from Administration. Christmas Break non-school days Friday, December 16 through Monday, January 2, 2017. Students return Tuesday, January 3, 2017. 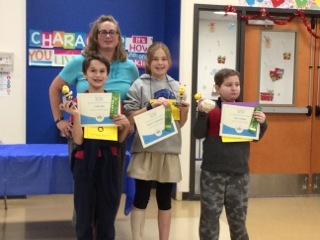 The Legacy Academy Spelling Bee was held last week on December 8th. The winners will move on to compete against other area schools’ spellers on Thursday, January 12th, at 4pm in the EHS Cafetorium. 2nd place – Cody Bell, 6th grade. Congratulations students! Thank you, Mrs. Crookshanks’ for heading up the Spelling Bee. We appreciate your dedication and time spent every week preparing the students for the spelling bee. Fourth grade Market Day 1:00pm to 3:00pm. All grades will have an opportunity to go shop at market day and make purchases. Most items cost .25 to $1.00. The Legacy Academy Board of Directors has recently sent a survey to all Legacy parents. Results from this survey go directly to the Legacy Academy Board of Directors, which is comprised of parent volunteers. The Board uses your feedback to ensure that the Vision and Mission of the School are in line with the desires of our families. As a Charter School, we are a school of choice and the Legacy Academy Board of Directors continually strives to make Legacy Academy the best possible choice for your students. We value your input and look forward to hearing from you. Your input is kept confidential. The 2016 Spelling Bee will be held Thursday, December 8, at 3:45pm in the cafeteria. Please plan on attending and cheering on some of Legacy’s best spellers. As a reminder, there will be NO SPELLING BEE PRACTICE on Tuesday, December 6th.